I need absolutely no excuse to bake. But if there is a holiday involved, I will drop anything and everything to break out the stand mixer. 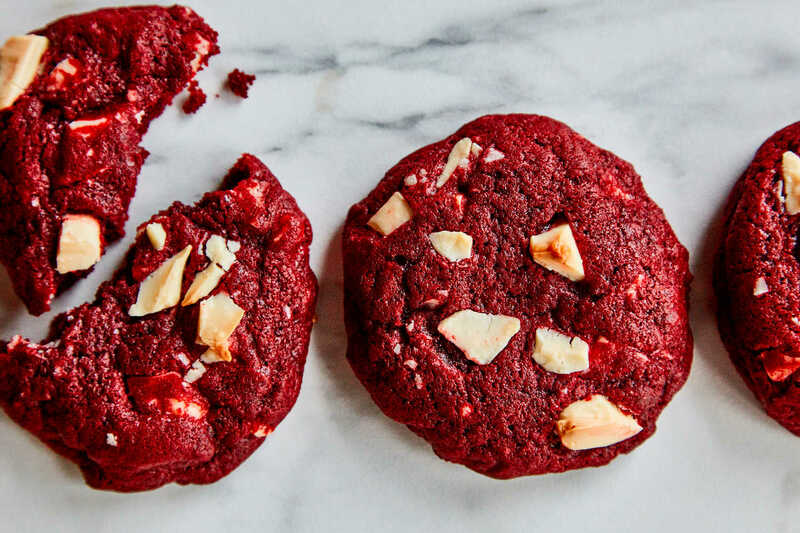 With Valentine’s Day coming up, I immediately thought about making red velvet cookies, inspired by the classic red velvet cake. The bright cheery red color is appropriate for the holiday but requires less effort than the traditional layered red velvet cake or cupcakes. These are the sort of treats you can whip up on a weeknight and share with your friends, loved ones, and co-workers. I think of them as a sort of no-pressure Valentine’s treat for a holiday that can seem loaded with pressure to perform. These cookies are pretty much foolproof in both the making and baking. The dough comes together quickly and easily, and I like to save some white chips to place on the cookie after I bake them. This gives them a professional, picture-worthy look. You can even make these cookies ahead of time and freeze them or freeze the dough unbaked. Just portion out the dough into balls, then place in a zip-top freezer bag. For baked goods, make sure they are completely cooled before freezing. Both the raw cookie dough or already baked cookies are good for up to a month. THE WHITE CHIPS: YOGURT OR CHOCOLATE? Initially, I thought that yogurt chips—those tangy chips you often find as a topping at the frozen yogurt shop—would be the perfect stand-in for the cream cheese frosting traditionally used for cakes and cupcakes. The problem is yogurt chips are hard to find! Sure, I could order them online from a place like Nuts.com but I’m the sort of guy who hates ordering specialty ingredients online. So I stuck with white baking chips, otherwise known as white chocolate chips, which are widely available at most supermarkets. A lot of folks I know don’t really care for white chocolate. They find it too sweet and claim it is not real chocolate. I tend to think of white chocolate as a completely different creature from dark and milk chocolate—so I don’t make those comparisons, really. When you are looking to buy white baking chips, flip the bag over and look at the ingredients. Make sure they have cocoa butter in them. That will ensure that the white chips are of a higher quality. Lower quality white baking chips, even if they are labeled as white chocolate chips, tend to have palm oil or other fillers and taste of sugary sweetness with little complexity. One of my favorite white baking chips is by Guittard. Their Choc-Au-Lait is a vanilla milk chip that has a nice round, pronounced flavor that isn’t too sweet. But if you are totally averse to white chocolate, feel free to substitute dark or milk chocolate chips in place. The cookies will just not look quite as “red velvet”-ready. 1 Preheat the oven to 350°F. Line two baking sheets with a silicon baking mat or parchment paper. 3 Add the egg and egg yolk: Scrape down the sides of the bowl with a spatula and add the egg. Mix to incorporate on medium speed. Repeat with the egg yolk, and then the red food coloring, mixing on slow speed to avoid splattering the red food coloring. 5 Add the white chips: Add 1 1/2 cups of the baking chips to the dough, reserving 1/2 cup of chips for topping the cookies. Slowly mix in until the baking chips are evenly distributed. 6 Shape the cookies: Wet your hands under water then slightly dry them with a paper towel. With your hands still moist, roll out 1-inch balls (heaping tablespoons) of dough, placing them on the prepared baking sheet. 7 Bake the cookies: Bake the cookies, one baking sheet at a time, for 11 to 13 minutes or until the edges of the cookie are dry and set. The cookies will look a bit puffy and plump. 8 Top with chips: While the cookies are still warm, press several white chips into the top of the cookies while they are still hot and puffy. Let the cookies cool on the baking sheet for 5 minutes before transferring the cookies to a wire cooling rack. The cookies will deflate a bit and flatten slightly as they cool. Repeat with the remaining dough. 0 Response to "Red Velvet Cookies Recipes"